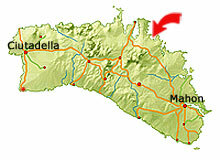 The holiday resort Arenal d’en Castell is located in the north-eastern part of Menorca approx. 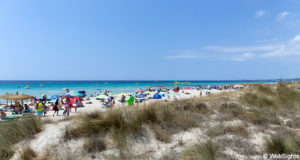 20-30 minutes by car from the airport near Mahon. 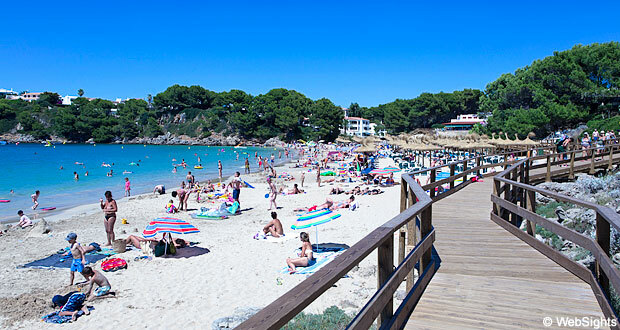 The beach in Arenal d’en Castell is beautifully located inside an almost circular bay, which protects the beach against waves. The beach is approx. 650 m long and has fine-grained, bright sand. The water is crystal clear and the bay is perfect for a long swim. There are many sections with sun lounges and sunshades, but there is also plenty of room for those, who prefer to lie on their towels. Visitors coming by car can park it on the road behind the beach. The beach is well protected against waves, the water is shallow and the sand is delightful. A perfect beach for families with children. It is possible to rent water bikes, but otherwise, the bay is free of any noisy water sports. In the western part of the beach, there are some restaurants right behind the beach. They are located a bit above beach level and have a beautiful view of the bay. 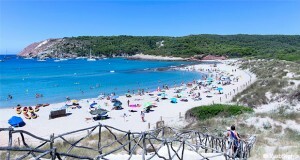 Arenal d’en Castell is particularly suitable for families and couples looking for a quiet place to spend their holiday. 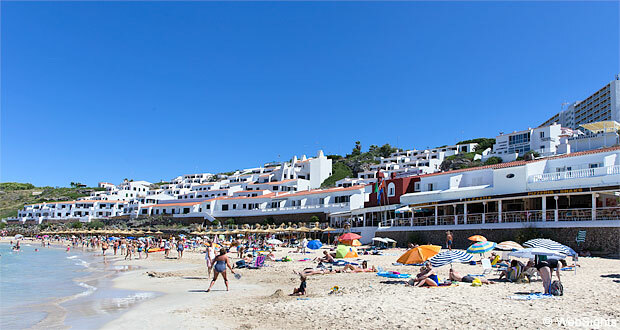 The holiday resort has a fine selection of restaurants, a few mini markets, tourist shops and, not least, the splendid beach. If the children need a break from the beach action, it is possible to go to a small water park at the Marina Parc hotel, and close to the beach, there is also a small play land with bouncing castles, trampolines etc. 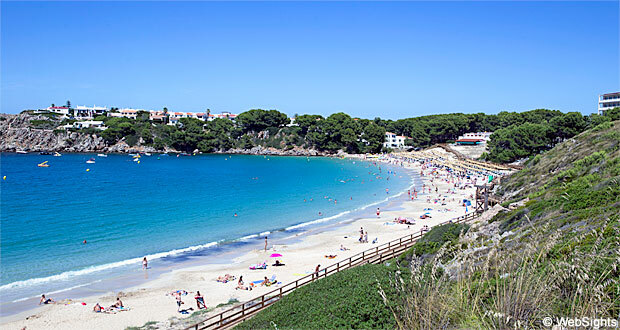 It is also a good place to rent a car and visit the lovely fishing village Fornells or to go see the capital of Menorca, Mahon. The charming old quarter is one of the town’s many attractions.